The Batman Selina Kyle Catwoman SDCC 5 inch Action Figure Mattel S72-2. Condition is Used. Shipped with USPS First Class Package. Both loose but in great condition. Comes exactly as shown. We believe that everything could be solved by kindly communication. We will try our best to sort it out. ~~~~~~~~~~~~~~~~. 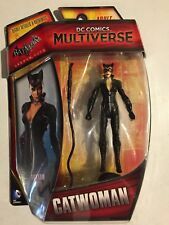 DC Comics Multiverse Batman Arkham City Catwoman 4-Inch Action Figure,New! This is a 2015 Mattel Action Figure Made for DC Comics/WB Studios, for Their Multiverse Collection/ Batman Arkham City, of Catwoman, Based on the Very Popular Video Game!,Highly Detailed, & Expertly Sculpted, Multiple points of Articulation, She stands Approx. 4" Tall, Accessories include a Base/Stand, & Her Infamous Whip, Great Graphics on Card!, It is Brand New!, Never Opened!, & in Great Condition!, Their is some minor wear, including some edging, small creases on back bottom of card,( Please see photos), Thanks for looking!, & Please check out my other listings! All orders are packaged very securely to help prevent shipping damage! Catwoman Action Figure Mattel Movie Masters Batman Dark Knight Rises 6"
Don't miss out on this rare set! Check our rates. Unless otherwise stated, all movies and comics DO NOT contain Digital Editions. Low price!! Don't miss! the best gift! ARKHAM CITY-. CATWOMAN & BATMAN. DC UNIVERSE LEGACY EDITION. CONDITION: Nearmint-Mint (factory sealed). 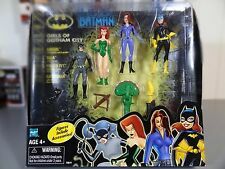 DC Comics Multiverse: Batman Arkham City: CATWOMAN 4" Action Figure! DC COMICS MULTIVERSE. ARKHAM CITY CATWOMAN. This item is very clean and has been examined thoroughly. Includes: Figure only. Size: 3.75", 1:18 scale. Condition: Excellent quality with tight joints. 9 /10 100% guaranteed to be received as listed. 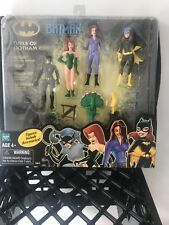 The item that you are viewing is a The Batman 2005 COMIC CON EXCLUSIVE CATWOMAN FIGURE box AUTOGRAPHS from the cartoon. This item is sold as in the photos. Feel free to contact us if you have any questions! New in box, never opened! DC UNIVERSE YOUNG JUSTICE JLU catwoman ACTION FIGURE 3.75"
In good shape, has normal shelf wear. Trending at C $43.64eBay determines this price through a machine-learned model of the product's sale prices within the last 90 days. BATMAN LEGACY EDITION. SEALED CONDITION. YOU WILL GET THE EXACT ITEM IN THE PICTURE. Batman Arkham origins legacy figure two pack Batman and Catwoman by Mattel. Figures are mint in box, box as some minor dents on the corners (pictured) window on box is intact and clear. Any questions feel free to ask. Thanks for looking, feedback appreciated PayPal only. Box has scratches on the plastic. Don't miss out on this rare set! DC Comics Multiverse BATMAN. Fed Ex is not an option. Sorry no exceptions! ARKHAM CITY EXCLUSIVE. LEGACY EDITION. GREY VERSION. I DO THE BEST ON INFORMING ABOUT ANY PRODUCT SPECIFICATIONS AND PRODUCT'S CONDITION. A great addition to any collection and a must have for DC collectors. Legacy Edition - BATMAN & CATWOMAN (B&W VERSIONS) - ARKHAM CITY / ASYLUM ORIGIN. 1998 CATWOMAN (exclusive Black suit variant). BATMAN: The Animated Series. Condition: overall excellent. nice paint, nice joints.